In my last post I asked the question of Why Dont RV Tires Get Recalled? Today I want to outline the process of how to file a proper complaint with NHTSA so there might be an actual investigation started. The National Highway Traffic Safety Administration is a part of the US Department Of Transportation. They cover vehicle safety issues. 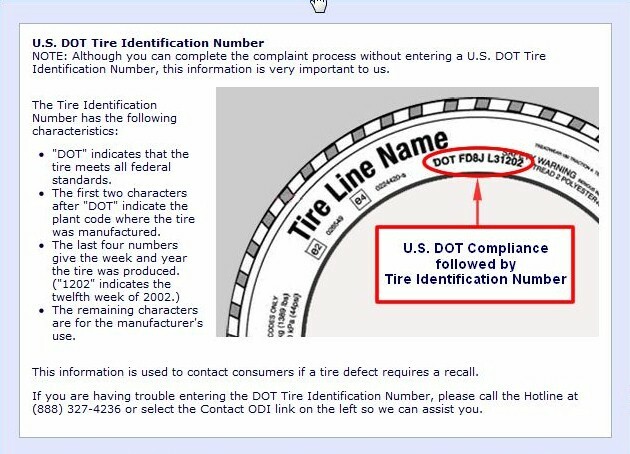 There is an Office of Defect Investigation that looks at vehicle and tire related failures and the ODI has on-line forms you can submit if you think your tire or vehicle has a safety related defect or failure. We will be focusing on tire related issues in this series of posts. Data on tire failures is normally submitted by tire manufacturers or importers or vehicle owners. This information is reviewed by ODI and a mandatory recall may be ordered by NHTSA or a voluntary recall may be initiated by the tire manufacturer. Michelin initiated a voluntary recall in the case of the BFG light truck tire recall. If the volume of tires produced or imported in a specific size/type is less than 15,000 there is no requirement for warranty data to be submitted as I understand the rules. If there are a number of valid consumer reports to NHTSA of tire failures, the ODI can decide if a full blown investigation is justified. If the investigation reveals there was a manufacturing or design defect NHTSA has the legal authority to order the manufacturer or importer to recall and replace the suspect tires. Many times at no cost to the consumer. 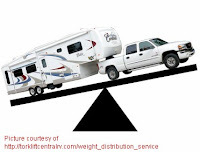 Many times the volume of tires used on RVs is well below the reporting threshold so even if there are a number of failures there may no report filed. Also sometimes the importer does not have the organization in place to track tire failures, so if the user doesn’t report the problem there will be no investigation. So the responsibility of reporting suspect tires is yours. Simply spouting off on a RV forum may make you feel better but it will never result in an investigation. You need to make an effort to assure the tire failure was not the result of a puncture, impact, leaky valve or due to the failure of some other vehicle part. A review of these posts Blowout, Run-Low Flex, Puncture or Impact will help you confirm the failure was not service related. If a tire dealer says there was nothing wrong with your failed tire ask them to point to the physical evidence they are relying on to make their statement. Just because you had the tire "adjusted" does not mean you can't file a complaint with NHTSA. I would not be surprised to learn that there have been cases where some tire failures were not reported to NHTSA by the importer. Below is a list of information you will need. I will use some of the information from the BFG recall as a sample. DO NOT USE THIS SAMPLE INFORMATION. You need to use the correct information or the complaint will be just a waste of your time and will get no results. o Vehicle Identification Number (VIN) Found on registration or insurance card and on the placard affixed to the side of your trailer.. It would also be a good idea to get a number of pictures of the tire failure for possible future use. These should be done in full sunlight and you need to be close enough to be just of the tire. If you look at the pictures I have posted in my blog you will see examples. A shot of the failed tire in full shade from 20 feet away will not be of much value. A close-up of the placard will also be of value as it is supposed to have make and manufacturer of the RV as well as the VIN. These pictures will not be submitted to NHTSA unless they contact you but if you end up trashing the tire it will be too late to collect the evidence. The rest of the process will be covered in the next post. In the time being you could practice and see if you can collect the DOT serial for all your tires and the vehicle VIN. You could even try and take some pictures of your placard and tires to see what it takes so you don't end up with just a black blob. I read this question on an RV forum. It was asked by someone complaining that there were no recalls of what he considered "crappy" RV tires. Other posts in the thread went on to say that complaints to the BBB or the tire importer won't accomplish much. I posted a reply pointing out that expecting the National Highway Traffic Safety Administration (NHTSA) to recall tires when there had not been any usable complaints filed, was simply unrealistic. NHTSA is the government agency charged with the responsibility of writing and enforcing the regulations necessary to achieve improved safety of vehicle systems and equipment. However they cannot order or even suggest that a vehicle or component be recalled without facts and data being collected and analyzed. A few months ago I worked with a reader of this blog, John B., who understood the necessity of providing the information NHTSA needs. He had suffered three tire failures. Luckily he discovered the failures before the tires suffered a detachment. In his case there was no loss of air and no flailing of tire pieces. What he did have was a tire that was no longer round or having a uniform tread contour. Now lets be sure we all have the same understanding of the terms. In this case a "Detachment" would be when a part of the tread or tread & belt package came apart from the rest of the tire. This type of failure can result in damage to the RV as pieces flail around hitting fenders and the side and undercarriage of the RV. John wanted to file a complaint with NHTSA and he wanted to be sure his complaints would be useful to the engineers. He understood that partial or incorrect information would result in no investigation and with no investigation there was no possibility of any action being taken to remove "crappy" tires from use. So John contact me and I walked him through the process of collecting all the details needed. He also wanted to dissect his tire so he could ship the important parts to me for further examination. When I received the sample I first cut the tread in the locations John had identified but found no serious issues. I then called upon my 40 years of experience and took the time needed to visually examine and take measurements with special tools to identify a location that was more probably of interest. After cutting the section at the location of interest and found the separation between the belts that was almost all the way across. 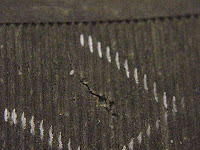 This separation allowed the tread area to bulge out to the shape seen in the picture of the tire at the top of this blog. For those interested these tires were not made in China as we decoded the serial and learned they were made in Mexico. With the physical examination complete, John was able to file the three complaints with NHTSA. Now it is important to remember that NHTSA has budget constraints so investigations need to be prioritized. Obvious defects that result in physical injury would receive top priority. Also a single or small number of complaints will be of lower priority than a large number so if the only complaints NHTSA receives on these tires are the three from John there may not be any action. The same situation would apply to any complaint you might file BUT it is important to remember that if the majority of people with tire problems only post to RV forums or grouse to others around the campfire nothing will ever happen or result in the quality of tires improving. A quick review of the complaint on file will show that the majority are of little or no value to NHTSA as the owner didn't provide the crucial information of a correct and complete DOT serial. Many complaints don't even provide the tire size or even the correct tire brand. I believe that if people spent half the time they do on RV forums but provided complete and accurate information to NHTSA we might all end up with better quality tires on our RVs. I am working on another post on the topic or how to provide meaningful information to NHTSA. 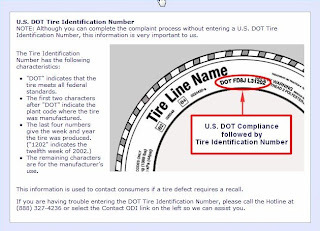 If you have a tire problem you need to collect the facts - Size, Brand, DOT serial and collect some good sharp pictures in case NHTSA needs them. Then make the effort to file a complaint. Who knows, you might just be able to grab the interest of the engineers and have an investigation started. Impact damage or Defective tire? How can fishing line help explain which? Many times the root cause of a "blowout" is impact damage. While there are many variable conditions such as speed, size of object being hit, tire inflation, spring rate, shock absorber stiffness, angle of attack, tire size and many others, I think we can all understand that it is possible to damage a tire if the right combination of factors occurs. Many times you hit something or drop into a pot hole and don't know it because the impact is small. Other times you may feel the impact but if nothing happens right at the instant of the hit, the event seems to get erased from your memory. While it is true that most of the time when you hit something no significant damage occurs, sometimes there has been damage and you may not see the result of the damage for many miles, hours or even days so you may not link the impact event with the tire failure. 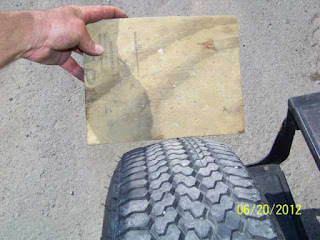 If there is damage to the tire, many times the damage is limited to the tire sidewall and could be in the side under the RV so you would not observe it unless you removed the tire from the RV. 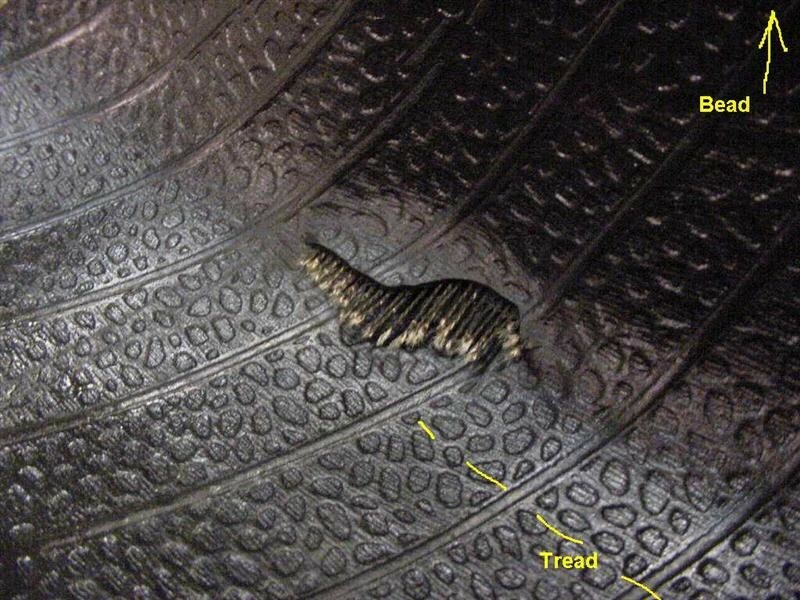 Sometimes the damage can damage the tread and belts. The main reason you don't always have an immediate loss of air due to the impact is because the damage occurs to the structure buried deep within the tire. In the case of sidewall damage it is the body cord that suffers a shock load and "snaps". Sometimes when it is the steel belts that are damaged you might have managed to bend the steel beyond its yield point so now it is kinked and experiencing a concentrated load at the location of the bent steel. The best way to think of how you "snap" body cord is to think of fishing line. Fishing line comes in different strengths just as tire body cord comes in different strengths. There are a number of the tradeoffs with going to higher strength cord than what you expect to need. Cost, weight and flexibility are some obvious examples so the tire manufacturer just like the fisherman tries to find a balance between stronger cord and the other measurable or desirable characteristics. Even if you don't fish you may know someone that does so you can check with them on this example. You can confirm that it is possible to catch a 10# fish using 5# rated line but it is also possible for a 5# fish to break a 10# line if the fisherman doesn't play the fish properly and there is a shock load because the fish jumped or the fisherman jerked the line too fast. The same thing happens with the cord in the tire. A cord that would normally be more than strong enough can be snapped if all the conditions as named above happen to result in a shock load. 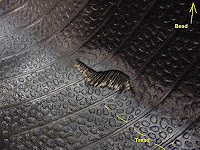 Here, below left, is a close-up showing damage to the outside of the tire at the exact location of the broken cord on the inside. 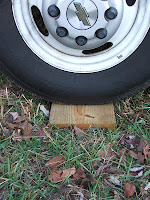 Now once the cord is broken the tire may continue to hold air with the remaining unbroken rubber as seen in the above picture. Only some time later when the rubber is heated up from driving at highway speed does the force of the inflation air exceed the decreased strength of the rubber. This delay can easily occur if the damage occurred shortly before you parked the RV for an extended stay at a campground. Days later as you pull out you would have completely forgotten about the deep pothole you hit as you turned off the freeway a mile from the campground. The result is a rapid loss of air. This event is often considered a "blowout" by the driver. A TPMS will not provide advance warning of the sudden failure because there was no loss in pressure till the rubber sidewall tore open. Tire engineers experienced in root cause analysis can sometimes find the evidence that established that there was an impact that ultimately lead to the sudden loss of air. Other times the less experiensed will jump to the erroneous conclusion that the tire was "defective" because they do not know the tell-tail signs to look for or really aren't inquisitive enough to make a sufficiently detailed examination. I hope this example demonstrates how it is possible for the owner to arrive at the wrong conclusion of what really caused the tire failure. Discovering the real "root cause" of a tire failure requires detailed examination of all the evidence. Seldom is the RV owner in the mood to spend an hour or so examining the tire or he may not have the equipment needed to examine it in sufficient detail to arrive at the real answer. Should we be concerned when our TPMS pressure readings vary by a few psi from each other? 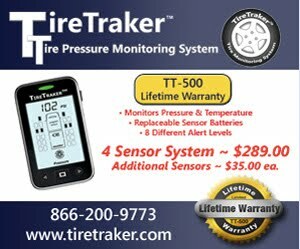 Before we get to the details of Tire Pressure Monitor System accuracy, it is important for us to understand the difference between a “Measurable” difference and a “Meaningful” difference. I think this concept can most easily be explained with a couple of examples. Money It’s easy to measure the exact difference in two amounts of money but when we do so will the results be meaningful? If a group of 50 people were to raise money for a small project and we count the money that the group had, I am sure we could arrive at a figure we all agree is very accurate. Let’s say we came up with $850.42. Now let’s assume a young boy came into the room and we included the money he had and now have $850.68. Clearly we have a measurable difference of 26 cents. But, is there a meaningful difference between the two sums? The difference is only 0.0306% or ½ cent per person. Would you feel the group had done a better job in raising money based on the new total? I don’t think so. I don’t think this measurable difference is very meaningful. Poison If we study botulinum toxin we learn that 0.035274 oz can kill 80,000 people. If we were to increase the amount of poison by 0.0306% an additional 24 people would die. Clearly if you were one of the 24 you would think this difference is very meaningful even though accurately measuring 0.0000108 oz is very difficult. When we look at tire pressure we need to keep the concept of measurable vs. meaningful in mind. Assuming we know our pressure gauge is accurate to within 1.0 psi or less. I think there are different goals for meaningfully different pressure settings. When setting the cold tire pressure on our RV I would be comfortable at +/- 3% of our goal inflation. This assumes a goal pressure of 65 to 120psi depending load, size and Load Range and would result in a range of about 2 to 3 psi from goal. For passenger car tires with goal pressures near 28 to 36 I would be comfortable at +/- 1 psi. 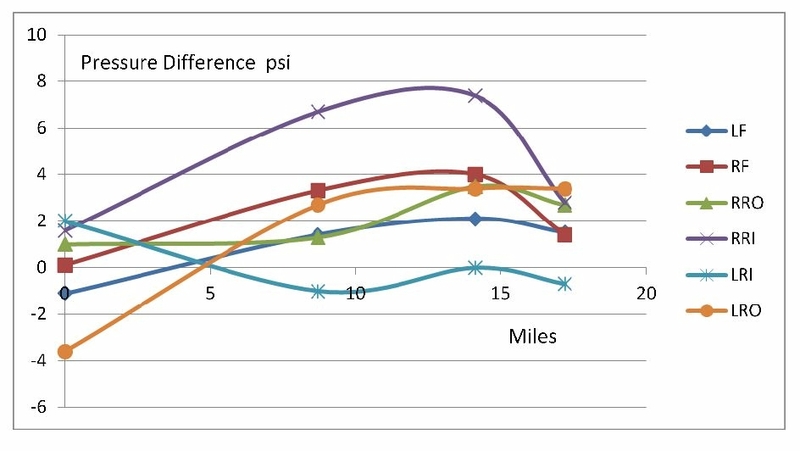 When I was racing and my goal pressures were in the 28 to 36 psi range with each tire being different, I asked my crew to set pressures at +/- 0.5 psi. Now what about TPMS accuracy? First, we need to remember that the TPMS is primarily a warning device and not a substitute for an accurate hand pressure gauge. This chart above shows the difference in pressure readings between two different TPM systems run at the same time on my RV. One was an internal system and the other was an external system using the screw on sensors. My cold goal pressure is 65 +/- 1 psi. At the start of the test the the ambient temperature was 68°F and the two TPM systems gave different readings. I ran the test for 17 miles with the cruse set at 60 mph with only the first 2.7 mi being non Interstate. You can clearly see the range of pressure readings. 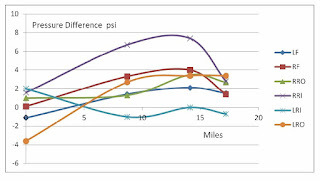 This data shows that the pressure readings from TPMS will vary from the actual inflation pressure by a number of psi. BUT since the intent of both systems is to warn when a tire looses pressure. I do not consider these differences MEANINGFUL as I have run a test on the warning pressure I have confirmed that both systems will give warning if I lose 12 to 15% in slow leak. Both systems also have a rapid air loss setting if there is a loss of as little as 3 psi over 1 min from the original setting. Since I set my cold pressure using my known accurate hand gauge, I do not worry when I see pressure readings that are different from each other as I drive down the road. P.S. I have parked my RV for the Winter. I will run a longer test next summer but expect similar results. Now is the time many RV owners are "winterizing" their RV. Even if you are in Arizona, you might be getting it ready to be parked for many weeks or months. There are a few things you need to do to help preserve your tires. 1. When you wash your RV prior to storage be sure to clean the tires. 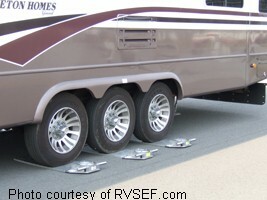 The easiest thing to do is to treat your tires just as you would the side of your RV. Wash the tires with the same soap & water you use on the RV body. You wouldn't use SOS pad on the bodywork so don't use coarse scrubbing material on the tire. 2. Inflate to the pressure shown on the tire sidewall. This will decrease the tendency to flat-spot and make the tire flat on one side. When I was checking the inflation I discovered one tire was almost 30 psi low. 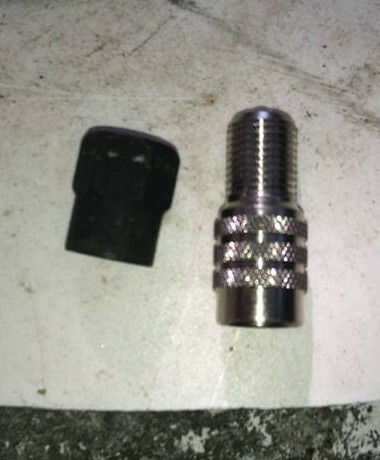 I knew the tire had not lost air when it was being driven so I immediately suspected that when I removed my external TPMS sensor the valve core must not have properly seated. This was confirmed with a shot of household cleaner. Here you can see the small bubbles that confirmed the 3.5 psi per week air loss past the valve. 3. If you are not parking on a concrete floor or pad it is suggested you not park on asphalt as the oils in the tar can attack the tread rubber. It is also suggested that you not park on dirt or sand as the moisture can migrate into the tire and possibly cause corrosion of the steel. I have some pressure-treated boards that are large enough to completely support the contact footprint. Here you can see the board and the reference footprint for a front tire. You always need to completely support the entire footprint. Both in length and width. These pictures show what NOT TO DO. Be sure the support is wide enough for both duals. Finally, be sure to cover the tires to protect them from direct sunlight, which can cause UV damage and overheat the tires. If you haven't read my series on Tire Covers simply check "Tire Covers" on the label list to the left. A little bit of preventive care can help avoid future problems and extend the life of your tires. P.S. Don't forget that even when parked you should check the air pressure once a month. If I hadn't checked the air in the tire with the leaking valve it probably would have been flat by next spring and might even have been damaged and unsuitable for highway use. 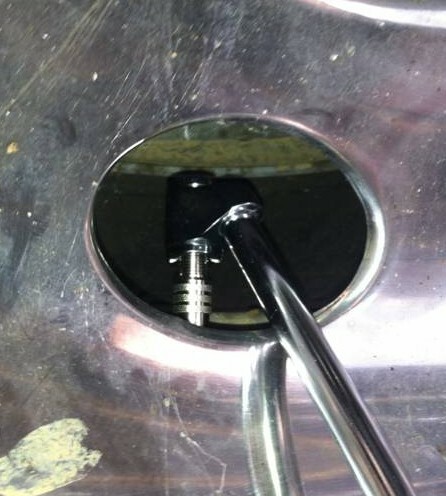 A review of some of the various RV forums will reveal that a fair portion of people have had some form of problems with valves and valve extensions. One poster provided a nice option that worked for him. 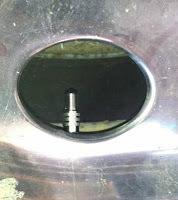 Jake L. from South Carolina had problems with getting his pressure gauge and inflation chuck onto his valve stem through the openings in his rim & hubcap. Jake had some 135 degree stems installed but the company doing the work apparently did not do the work correctly and his new stems leaked. He now has regular straight stems that don't leak but he can't get the double foot chuck to work. His solution was to use short extensions some call "Alligator". Here is a picture of the short extender. 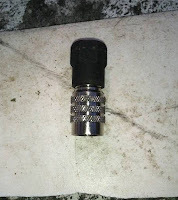 Note the nice metal valve cap. Some people incorrectly believe that the "Alligator" cap is an acceptable alternative to a regular cap as it allows you inflate or check the air pressure through a small "trap door". The problem with using the cap in this manner is that it will allow dirt and grit to enter the valve stem chamber. I covered the topic of dirt in the valve core 11/2/12. Check it out if you haven't already read it.. Here you can see that this short extension solved Jake's problems. Regarding the issue of keeping dirt and grit out of the valve core chamber, I think this is something very few ever think about. My short extension even carries the brand name "Alligator. This is what the end of the Alligator extension looks like. Here you can see how the extension works. 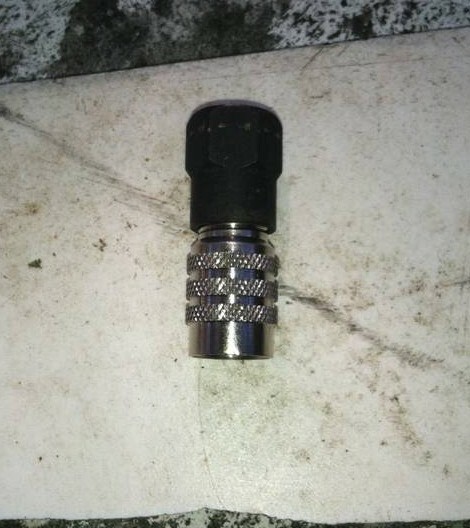 This part should not be considered a cap but just a very short valve extension.